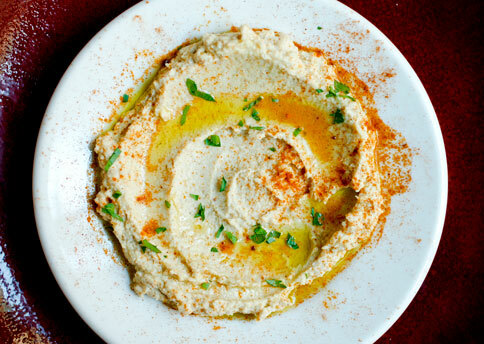 One of my favourites snacks with cut veg, and as an addition to flatbreads salads, falafel, or halumi. Super nutritious and really easy to make. Kids love it, especially babies!. This is my version, I have been making it for years but I know some women who have had recipes handed down and make it as part of their heritage for longer than me- I hope they approve of my recipe and welcome their comments and suggestions. Put the chickpeas, tahini, garlic, and lime juice in a food processor (or a blender for even smoother hummus), sprinkle with salt and pepper, and begin to process; add oil and chickpea-cooking liquid as needed to produce a smooth purée. Taste and adjust seasoning, adding more salt, pepper, or lemon juice as needed. Serve, drizzled with some olive oil and sprinkled with a bit of paprika and some parsley.